Everyone know that Diamonds are a girls best friend. 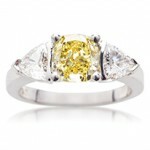 They are absolutely beautiful and are an ideal choice for engagement rings. But, wouldn’t you like something a little more unique and individual to you? Perhaps something with some colour to tell a story and look truly exquisite. It’s important to know, that not all gemstones are recommended for Engagement Rings and everyday. Only stones that are hard will have the durability to last everyday wear. When choosing a coloured gemstone to be used for an Engagement Ring, we would recommend something that is above 7 on the hardness scale. The best option is of course coloured diamonds. They provide the vibrant colour, as well as the hardness and durability needed for everyday wear. The next best option would be sapphires. They come in a variety of different shades and colours and are also very hard, so will be long lasting and make suitable option for an Engagement Ring. The Ruby would also make a good option for an Engagement Ring, as they are hard and durable. 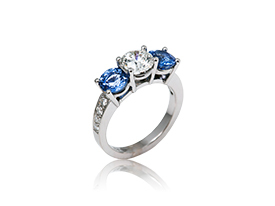 There are however, a number of gemstones that we would not recommend for Engagement Rings. Emeralds are a classic to be used for an Engagement Ring, but it’s really important to source a stones that is high quality and hard to last the distance. It is easy to choose an Emerald that is a bit softer and whilst it will still be beautiful, it may not be suitable to be worn on a daily bases. Similarly, Opals can be quite hard, but often can be difficult to source hard Opals, so we would recommend not using them for an Engagement Ring. Some other gemstones we don’t think are suitable to be made into Engagement Rings are, Quartz, Turquiose, Blue Topaz, Pearl, Amethyst and all other soft stones. These gemstones are undeniably attractive to the eye, but make better suited to be made into fashion rings and jewellery not to be worn on an everyday basis. For any questions about coloured gemstones and our recommendations for what should be used for Engagement and Wedding Rings, please contact us.